I've been feeling really great the last few weeks and I know I have running to thank for it. Unfortunately, the scale hasn't been much of help and it's really starting to frustrate me. I still have my birthday goal in the back of my mind, but it feels like it's slowly slipping away. I've also been toying with the idea of changing my weigh in days to Monday. I think weighing in on Mondays would keep me more accountable through the weekends, but it also scares me! I hadn't decided on anything until I read this post over at Minus One Hundred. 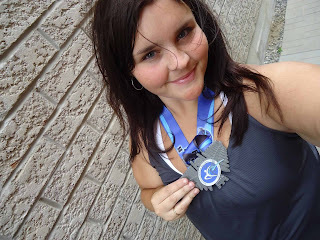 She has just signed up for a "Lose a Marathon Challenge". - There are over 800 participants! This challenge came at the perfect time! I think it was a sign that I stumbled upon it before the 25th. My birthday goal (which I'm still aiming for) is to lose 30 lbs by September 1st (229lbs). 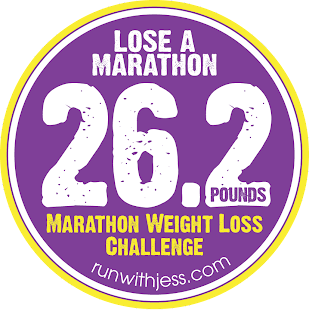 The Lose a Marathon Challenge would bring me to 231.3 lbs by Sept 17th. Both of those goals sound good to me, but at the rate I'm going the Lose a Marathon Challenge is more realistic. Weighing in on mondays makes me very nervous. I'm going to weigh in this friday and then again on Monday and I'll continue to weigh in every monday throughout the summer. Yikes! We have a lot of weekend plans coming up, so hopefully this will help me stay on track...that is the point, right!? The challenge for week 1 is to write out your plan and goals. I'm going to add another page to my blog where I'll post my goals, progress, "before" pictures and my measurements. Stay tuned! I'm so stoked that my favorite blogs are joining the challenge! :) It's going to be fuuuuuun! LOL We can do this!